The warmer weather combined with the excessive amounts of rain we have had so far this season have created a perfect environment for mosquitos to breed. 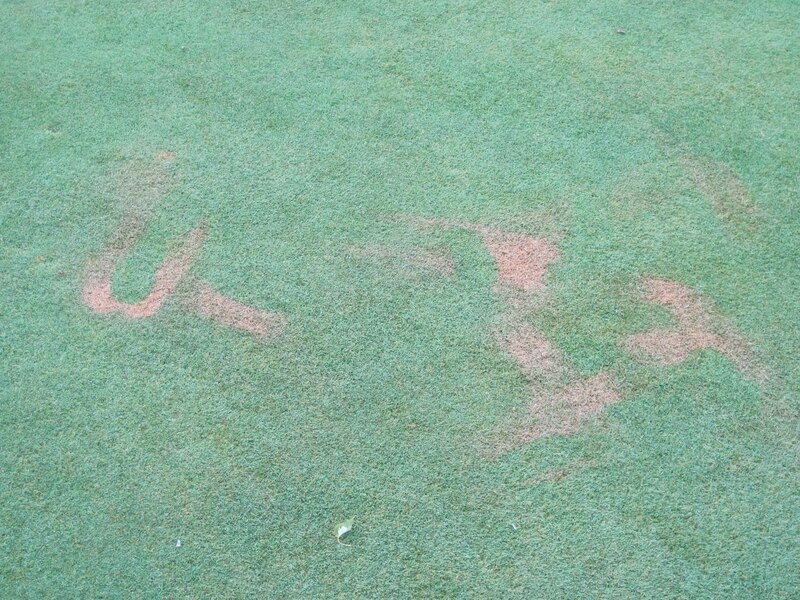 Please keep in mind that bug spray will kill the turf, so always apply when you are standing on a paved surface. Thanks for you cooperation and enjoy the warmer weather. 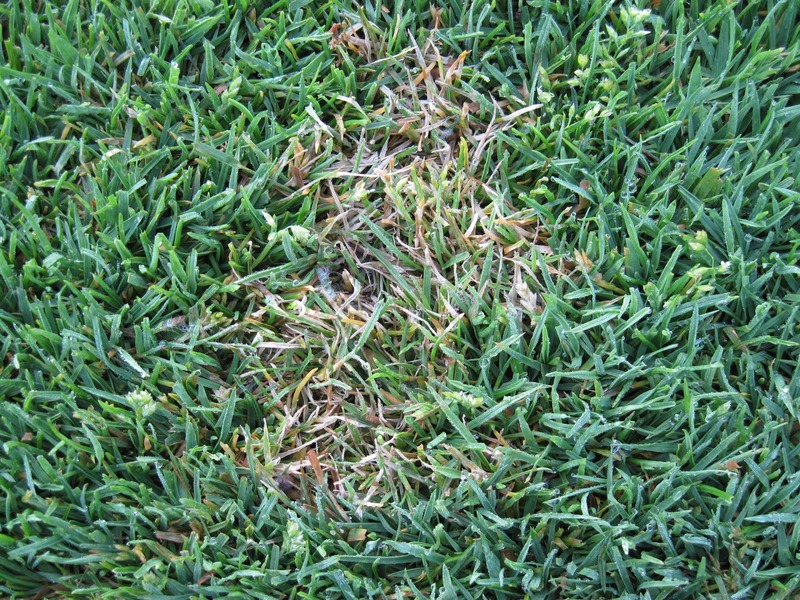 Dollar Spot is one of the most easily identified diseases in turf. 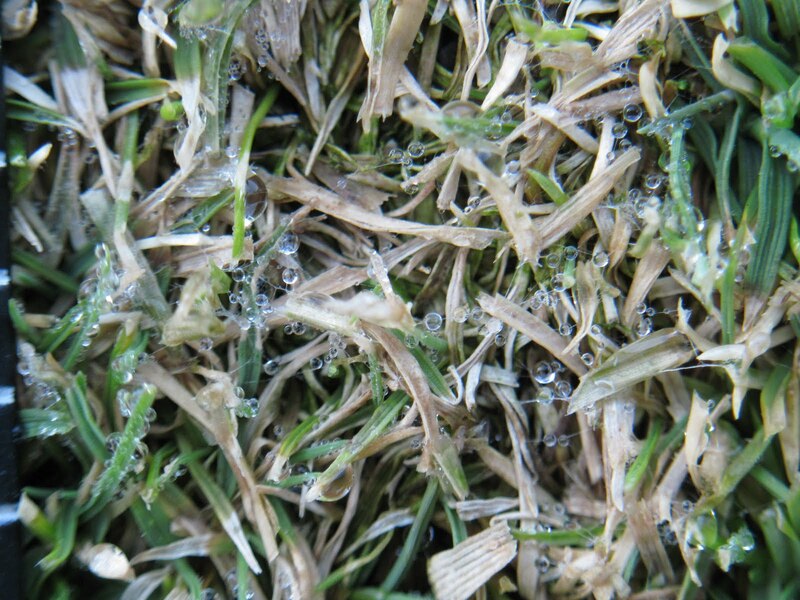 It can affect several different types of turf and has a wide range of conditions in which it can be active. The disease is caused by the fungal pathogen Sclerotinea homeocarpa and, if left untreated, can cause poor playing conditions. Luckily, the pathogen does not affect the crown or root of the plant, so new growth can be initiated once the pathogen has been suppressed. On mornings with heavy dew, white mycelia can be seen on the infected leaves (see picture below). 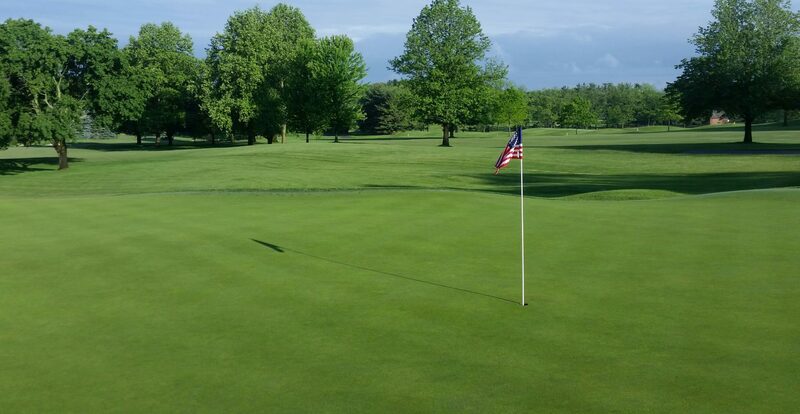 Thanks to Mother Nature and her propensity for ill-timed and excessive rains this year, we have been unable to adhere to our normal preventative spray schedule. Because our normal applications have been delayed, the pathogen has had an opportunity to become active and begin to show signs of damage. Damage has been seen on a handfull of tees (#’s 1,3 and 14) and fairways (#’s 7,10,16 and 17). 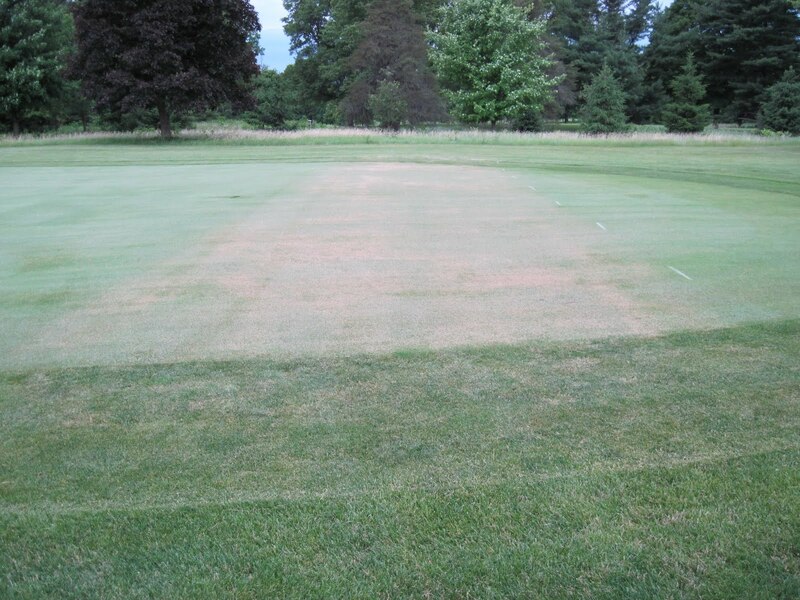 The aforementioned areas have had additional applications of fungicides made to them as well as foliar applications of nitrogen to improve plant health and help speed-up the recovery time. It is not uncommon for us to see Dollar Spot throughout the course of the golfing season because of my tendancy to apply fungicides at low end of the recommended rates, but this year there is more than normal. It is my hope that the weather will begin to cooperate and the turf can have a quick recovery. Until that time, we will remain vigilant in our preventive/curative programs as deemed necessary. As many of you are aware, I love to do research on the golf course. Whether it is a trial that I am approached with by a university, manufacturer or something as simple as me wanting to see how a new product performs, I am always trying to stay at the forefront of what is happening in the world of turf management. The particular area (#17 fairway) depicted in the photo above was sprayed with a new active ingredient, amicarbazone, that is being developed to selectively remove Annual Bluegrass (Poa annua) from Creeping Bentgrass. Two applications have been made, and by the looks of things, a third application will not be necessary. The hope is that this new product will allow the Creeping Bentgrass to fill the voids that are left from the death of the Annual Bluegrass.